Life with Giggles: Who said there are brownies?!?! For Christmas, the hubby bought me the Perfect Brownie pan. I was SUPER excited to use it. 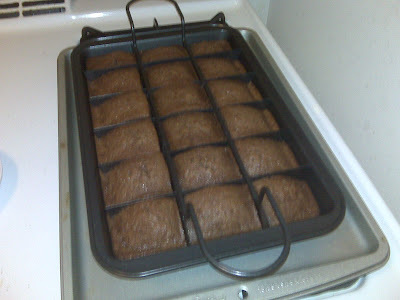 Yesterday I made my first batch of brownies! It started off with making the brownie mix. 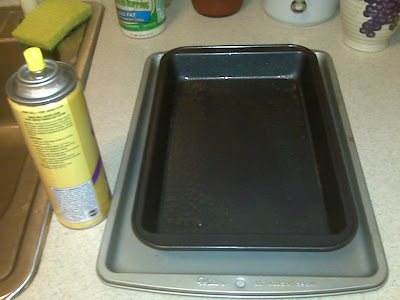 Then you have to spray a generous amount of cooking spray on the pan and divider. 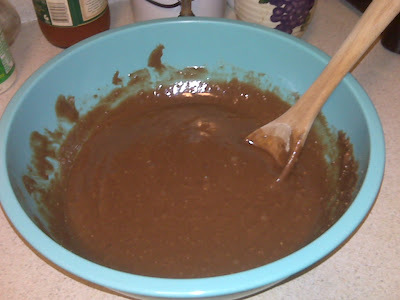 All you have to do is pour the batter in, spread it out (we failed to do this yesterday and the middle of the pan had the biggest brownies, but we didn't complain). Then off to the oven it goes. 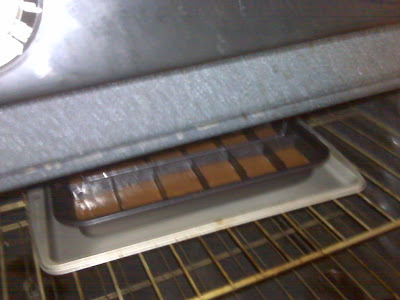 The brownies took about 25 minutes to bake and the whole apt smelled soooo good. Out they came! 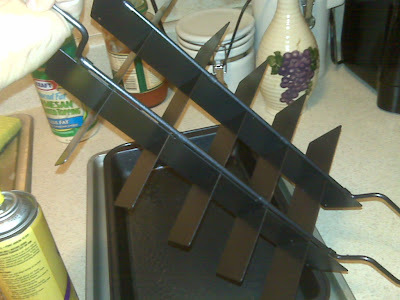 You let them cool slightly, then you gently life the divider up. PERFECT slices! Amazing. First of all, I have no idea why this picture came out blue looking... must have been the flash on my blackberry. Anyways, I tried using the stencils with powdered sugar, but wasn't too great at it. 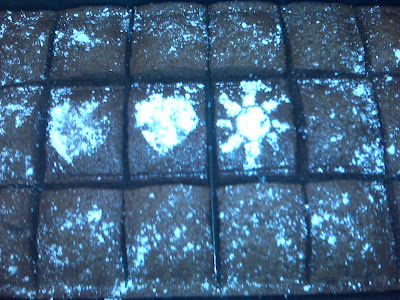 I think if there was icing on the brownie, the powdered sugar stenciling would have been much easier. Voila! Presentation amazing! They popped right up from the bottom pan and we're ready to eat. As you can see the hubby's hand sneaking in the picture to steal a brownie. He was too excited and REALLY wanted to have a brownie. 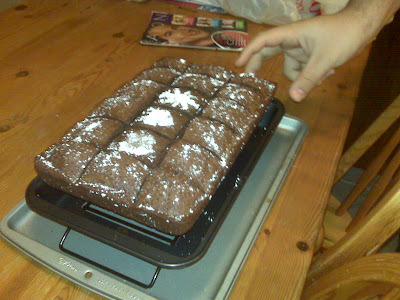 Perfect Brownie pan = SUCCESS! What's even better is that there are brownies left and I can't wait to get home and have another one! As Borat would say "You have great success". i wanted to order one of these but was so afraid it wouldn't do as promised. but your brownies look great! enjoy their deliciousness! 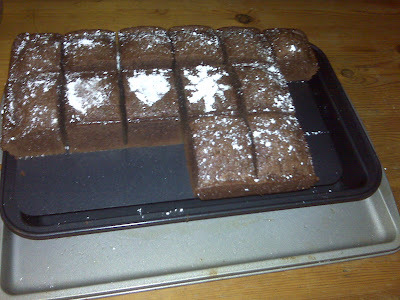 who needs a stencil when you can have BROWNIES!!!? That is so cool! I've never seen that before. I love how that way every piece is a 'corner' piece... mmmmm.